Wool felt - Refima s.r.o. Compressed wool felt belongs among the oldest textile materials used by the majority of industries for various purposes. Wool felt has a textile structure consisting of fibres that are permanently entangled and unified according to the degree of automation, chemical influence, and moisture used, without applying knitting, weaving, stitching, heat sealing, or gluing. Wool felt can be created from exclusively from one type of wool fibre, or as a blend of new and recycled wool fibres mixed with artificial fibres, vegetable fibres, etc. Wool felt is a traditional material in the history of humankind. It is safe for the environment, with the possibility of biological disposal, with a special focus on environmental improvement and healthy fauna and flora. Wool felt products are good examples of ecological industrialisation. Raw wool of a required quality is evenly manually mixed. In felt manufacturing, wool fibres with a diameter from 22 to 28 microns are normally used. 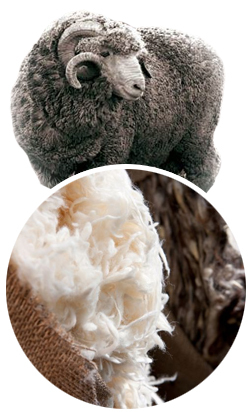 Blend felt means that the raw wool is mixed with artificial fibres according to the ratio requested. Wool fibres are open and divided according to their utilisation by a wool opening machine. Spikes and wires on this machine help to untangle the wool fibres. Wool fibres are carded and straightened on a carding machine. This machine contains cylinders covered with wire clothing. The cylinders rotate in opposite directions and function as a comb for the wool threads. Separate layers of wool fibres are placed layer by layer on a working table. The number of layers depends on their thickness and felt density. This process is done with the help of a milling machine, and serves to entangle all layers of wool fibres into one piece using moisture. Continuous pressing is used depending on the firmness, so that the required density is achieved. Felt straps are processed by electrically heated cylinders, so that the felt is evenly thick throughout the felt sheet. Felt straps are then cut and die-cut according to the customers’ needs, then they are rolled. Finally, the felt is properly wrapped in plastic foil.